The descendant of men who survived the Amritsar massacre in 1919 says an apology from the British government is "futile". Hundreds of Indians were shot dead by British troops 100 years ago on Saturday, and there have been calls for Britain to apologise. UK prime minister Theresa May stopped short of a formal apology this week, describing the events as "a shameful scar on British Indian history". Dr Raj Singh Kohli accepts the outcome. His great-uncles were caught up in the events of 1919, but he maintains an apology is "unwarranted", citing the passage of time. He said: "Part of being a British Sikh means you carry around colonial guilt. "I know that sounds bizarre, but my feelings of what it is to be British very much are centred around what Britain was and what Britain has learnt, and what Britain is now." 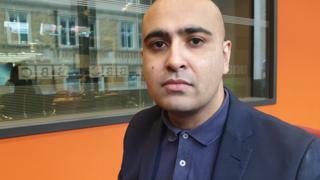 Dr Kohli, from Rugby, Warwickshire, told BBC Asian Network: "I think an apology now is rather futile, a little unwarranted actually." The shot Indian civilians 100 years ago were attending a public meeting at Jallianwala Bagh, a public garden in Amritsar city. Dr Kohli's great-uncle, Balwant Singh, was trampled on and trapped for hours under bodies. "When the firing started, two of [my great-uncles] managed to escape. I'm not sure if they scaled the walls or they managed to get through any of the remaining entrances that were open." Should Britain apologise for the Jallianwala Bagh massacre? After the shooting, Dr Kohli's relatives fled India. "My great-grandfather, who was the assistant deputy commissioner of the Burma Military Police, was advised that his sons needed to leave the country. "And they were subsequently exiled from India." Image caption Dr Kohli's mother Jagjit Kaur says the government must "admit that it was a mistake done by one of their men"
British dignitaries, including former prime minister David Cameron on a visit to the city, have expressed deep regret for what happened. But that does not go far enough for Dr Kohli's mother, Jagjit Kaur, 78, whose view differs from that of her son. "[The British government] must recognise and admit that it was a mistake done by one of their men, who was employed by them - whether the government gave him permission or not," she said. "My grandmother, she cried all her life since then. She never saw her sons again."